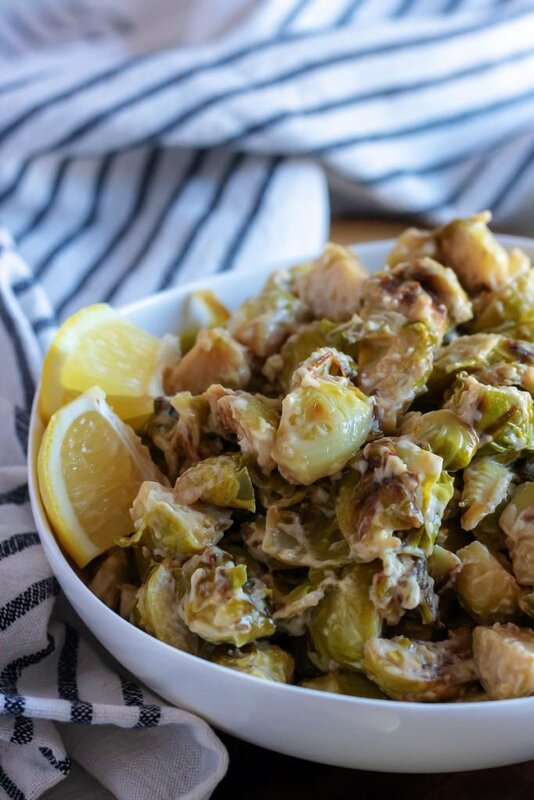 Brussels sprouts often get a bad rap, like that one kid who shows up at the party possibly invited, maybe, but the sender of the invitation wasn’t really serious and didn’t actually think they’d show. Sadly, they’re a most undervalued vegetable. Even when served, most people take one look at it- make a quick judgement, and low-key push it to the side of their plate. It doesn’t have to be like that though! And I’m hoping today that I can show you that these tiny little cabbages are one of the most maligned veggies out there, and for no good reason. Oh wait! They did get a bad rap, and to this day- I’m still not entirely sure why. I mean, I know my own grandparents tended to serve them boiled. Not my favorite way; my least favorite way actually. Probably almost everybody’s, too. Those I tolerated, but didn’t enjoy. Mostly because I knew I wasn’t getting up from that table without a clean plate, and there wasn’t a dog to sneak any to. And how could I have been expected to enjoy them anyway? I’d been so spoiled by other, much yummier versions. While I’m not exactly sure why so many of my grandparent’s generation were bent on serving boiled sprouts, I am sure that they were on to something in the sprouts can be so good, and also good for you, if you’ll only give them a try- or two. If you hadn’t already heard (I was late to this particular party myself), sprouts are a superfood. They’re loaded with vitamins & nutrients, perfect for helping overall health. A quick Google search will lead you down a virtual rabbit hole with just how much of a punch they pack. A few highlights though include- antioxidants, vitamins K & A, folic acid, Iron, zinc, being great for hair & skin health, and the ability to boost the blood supply. The other little known fact about sprouts that makes them so magical? Despite their pungent, unattractive smell- they absorb and take on flavors really, really well. Who knew such a tiny vegetable could soak up so much flavor?! Also, like onions- they get sweeter when they caramelize, and their natural sugars are released. 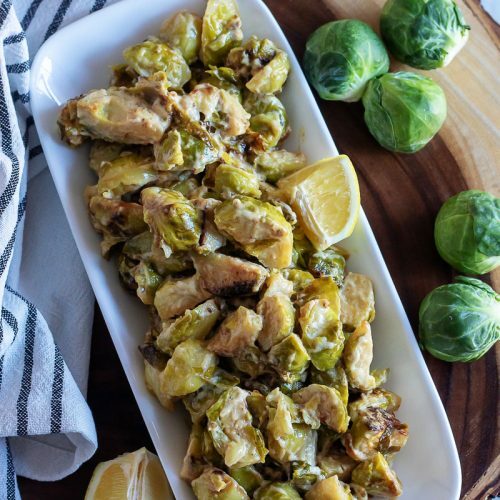 In the oven, or the pan, roasting is absolutely the best way to go about preparing them- which is just what we did with these Cream Braised Brussels Sprouts. A quarter cup of butter is melted in a large, cast iron skillet. Then the sprouts are added and cooked, stirring occasionally until they’re starting to caramelize & nicely browned in spots. Usually it takes about 5 minutes. A bit of heavy cream is then added to the pan and brought to a simmer. The skillet’s then covered, the heat reduced to low, and the sprouts are simmered for 30-35 minutes, or until they’re fork tender & easily pierced. The overall amount of cream will have decreased and been absorbed some by the sprouts, which will be a lovely creamy beige. The lemon juice is then stirred in and the mixture is left to simmer some more, until it thickens and nicely coats the sprouts. 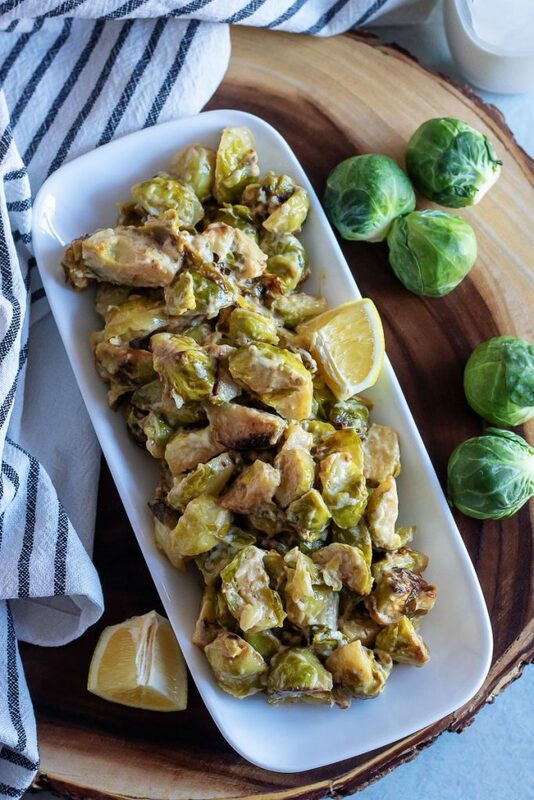 The cream braised Brussels sprouts are then seasoned, to taste with salt & pepper if needed and/or additional lemon juice, and transferred to a serving dish. Don’t be surprised when people fawn over them, go back for seconds or thirds (you might need to double the recipe depending on the occasion), or flock to them like seagulls. They’re really that good, addicting almost. 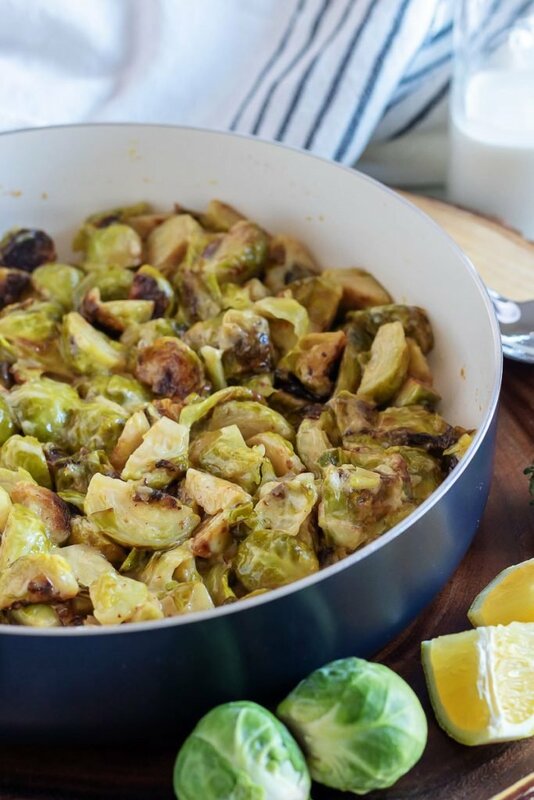 These buttered, pan fried sprouts are simmered in a rich cream sauce resulting in a nutty, roasted sprout that will probably end up being the best you've ever had. In a cast iron skillet, melt the butter over medium-high heat. Stir in the sprouts, sprinkle with salt and stir again. Cook the sprouts, stirring occasionally, for 5 minutes- until they've begun to brown in spots. Stir in the cream, and bring the mixture to a simmer. 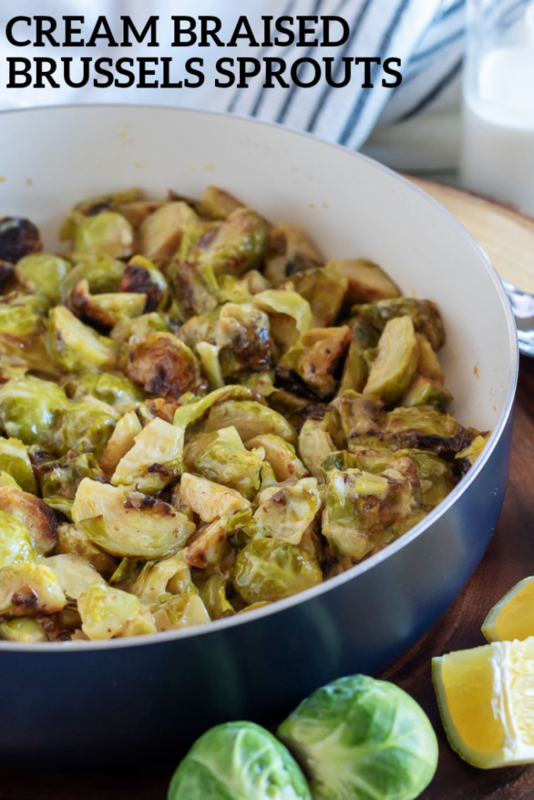 Reduce the heat to low, cover, and simmer until the sprouts are tender and easily pierced with a fork, 30 to 35 minutes. The cream will have reduced in volume, and will have taken on a creamy beige color. Remove the lid, and stir in the lemon juice. Allow the sprouts to simmer a few minutes more until the cream thickens and coats the sprouts. Season to taste with additional salt and lemon juice before serving. 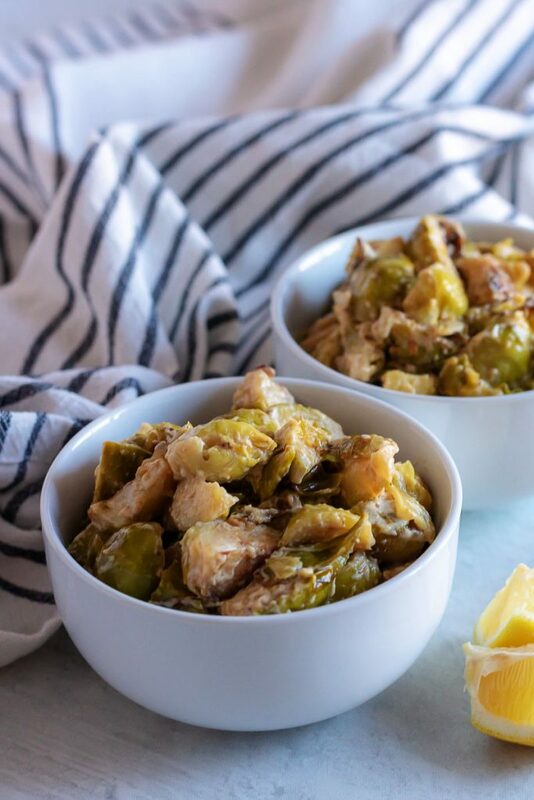 I love Brussel sprouts and you recipe only makes them better 🙂 Thanks for sharing on Fiesta Friday!